The GJA Alumni, Ms. Nagma Khan cleared the UP Judicial Services Exam with distinction. On behalf of the GJA, I am pleased to inform you that the GJA Alumni, Ms. Nagma Khan, has cleared Uttar Pradesh PCS (J) 2016 and secured 29th rank in the prestigious examination. Very soon she will be appointed as a Judge/Magistrate in the state. Nagma completed BA LLB program from USLLS, GGS University, Delhi in 2016, and ranked 3rd. She is currently studying for an LLM degree at Jamia Millia Islamia, Delhi. We all at the GJA, congratulates Nagma for her remarkable success, that she attained due to her hard work and best wishes of her family and friends. Nagma has actively participated in various seminars, conferences, clubs and other events throughout her academic life. 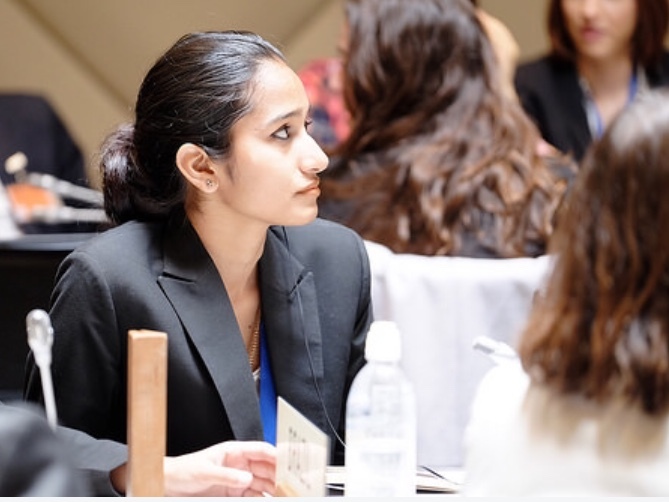 She participated in the Oikos Model WTO 2015, a one week simulation jointly organized by University of St. Gallen and World Trade Organization at St. Gallen and WTO Headquarters, Geneva. Nagma won the best delegation award at the event as a consequence of which she attended a week’s summer course at WTI, Bern the same year. Later, she presented a paper at the 3rd International Social Sciences Conference, Islamabad, 2015 organized by Higher Education Commission, Islamabad and University of Peshawar, Pakistan. Nagma has done her 10+2 from Ganga International School, Delhi where she has been a part of the Indian Delegation for SAARC High School Student Exchange Program held at Japan 2010. Further she has been a recipient of the Times NIE Student of the year award 2010-11. Last but not the least she topped her hometown Sambhal, UP during 10th Board securing 95.4 percentage. From where we stand, Nagma’s distinguished record, coupled with her long-standing commitment to, and hard work for, the betterment of the community, provide clear evidence of the kind of person she is, and the kind of discernment she'll bring to the bench and bar alike. In short, Nagma has proved herself worthy of being a Judge, and worthy for a bright future at the bench. We wish our Nagma well and thank her for accepting this responsibility to serve the public, the rule of law, and the justice system. We hope that her new responsibility will allow her to fulfil her commitment to serving the public and the court system, which in turn helps fulfill the constitutional promise of justice for all. We again congratulate Nagma on her outstanding performance and achievement. We all wish her luck for all the future endeavors she undertakes.